Try safe mode if your Mac doesn‘t finish starting up. You can use safe mode to help you resolve issues that might keep your Mac from completely starting up. Together, these changes can help resolve or isolate issues related to your startup disk. If you don't hear a startup chime after pressing the power key, see what to do if your Mac won't turn on. If your startup disk is encrypted with FileVault, you can still hold down the Shift key immediately after powering on your Mac to start up in safe mode. You might be prompted to log in twice as part of this process – first to unlock the startup disk, and a second time to log into the Finder. You can let go of the Shift key after you see the first login screen. If an issue doesn't happen when your Mac is started in safe mode, try restarting again without pressing any keys at startup. If the issue appears to be resolved when you start up normally, it was possibly caused by a cache or a directory issue with your startup disk that safe mode fixed. If you restart your Mac normally and an issue comes back when you reach your desktop, try disabling any login items that automatically open when you log in. If your Mac automatically restarts in safe mode, OS X might have found an issue that it's trying to fix. Safe mode performs a directory check of your startup disk, similar to what happens when you choose to verify or repair a disk using Disk Utility. If OS X finds an issue, the directory on your startup disk is repaired and your Mac restarts. If your Mac turns itself off when you start up in safe mode, check the power connection on your Mac to make sure it's plugged in securely at both your Mac and the power outlet. If you're using a MagSafe power adapter, make sure the LED on your power adapter is yellow or green. Then, try starting up in safe mode again. If your Mac repeatedly restarts or shuts down during safe mode, contact Apple Support, or consult with an Apple Authorized Service Provider or Apple Genius for more help. If you're not sure if your Mac is started in safe mode, you can use System Information to check this. The Software section of the System Information lists the Boot Mode as "Safe" instead of "Normal" when you're started in safe mode. 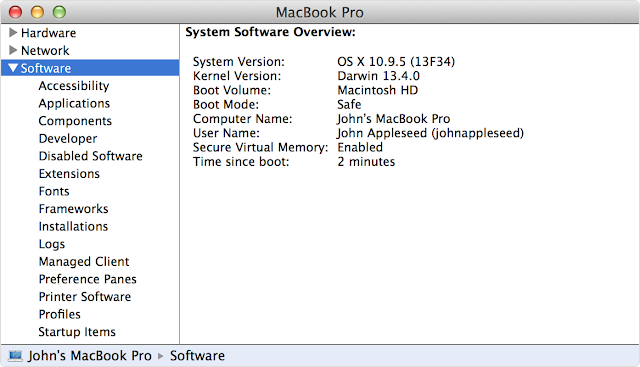 The login window also displays "Safe Boot" in the upper-right corner of the screen when your Mac is started up in safe mode. Some features of your Mac aren't available when it's started in safe mode, so after you're done using safe mode you should restart your computer normally. Some USB, FireWire and Thunderbolt devices might not be available. Wi-Fi networking might be limited or unavailable depending on the Mac and OS X version you're using. Safe mode in OS X v10.5 or later also disables accelerated graphics. This makes the OS X menu bar appear solid even if "Translucent Menu Bar" is selected in System Preferences. Your screen might also "blink" or "tear" during login when your Mac is started in safe mode. Safe mode in OS X v10.6 or later also disables File Sharing. If your Mac doesn't have a keyboard available to start in safe mode but you have remote access to it, you can configure the Mac to startup in safe mode using the command line. Access the command line by either opening Terminal remotely, or by logging into the computer using SSH.